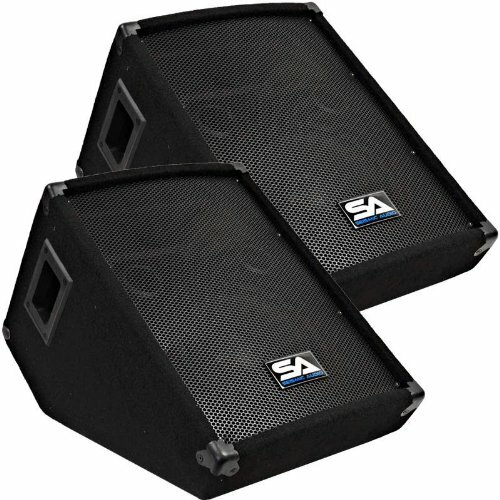 Pair of 10" Wedge Style Floor Monitors Model - SA-10M (Set of 2) 2-way 10" pro audio speaker with 40 ounce magnet and 2" voice coil 100 watts RMS and 200 watts peak 4x8 piezo horn tweeter two 1/4" inputs Frequency Response: 45 to 20,000 Hz Wired at 8 ohms 95 db Dual ports 18 gauge full face steel grill Black Metal Corners Pocket Handles 13.25" wide x 14" tall x 21" deep Weight: 22 lbs per monitor These monitors are brand new. 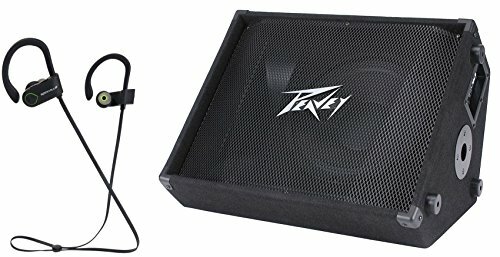 One year warrantyThis listing is for a pair of these monitors. You will receive two monitors, pictured and described above. Each monitor has the specs above.These monitors are great for vocals, PA systems, small DJ gigs, weddings, churches, and sound monitors. 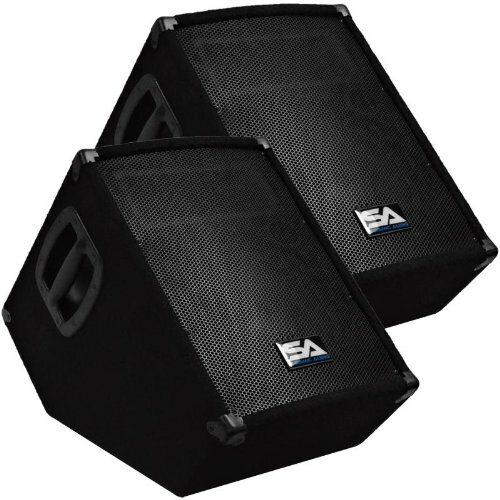 These can be used on any setup for full band or drum monitors. 10" monitors are ideal when you floor space is limited or your drummer needs a dedicated monitor and doesn't have much room. These 10" monitors take up a very small foot print on your stage. 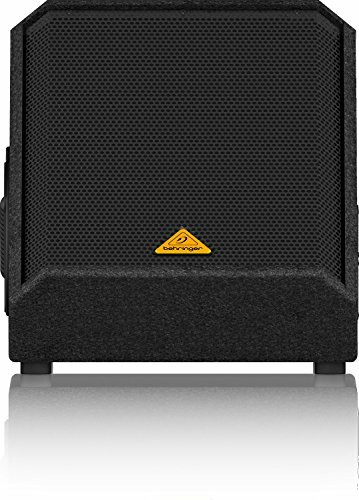 10inch Wedge Floor Stage Monitor or Speaker - Model - SA-10MSingle, 2-way 10inch pro audio speaker with 40 oz magnet and 2inch voice coil, 100 watts rms and 200 watts peak, 4x8 piezo horn tweeter, two 1/4inch inputs, Frequency Response: 45 to 20,000 hz, Wired at 8 ohms, 95 db, Dual ports, 18 gauge full face steel grill, Black Metal Corners, Pocket Handles, 13.25inch wide by 14inch tall x 21inch deep, Weight: 22 lbs per monitor, This monitor is brand new., One year warranty. It’s important that you can hear your music on stage. 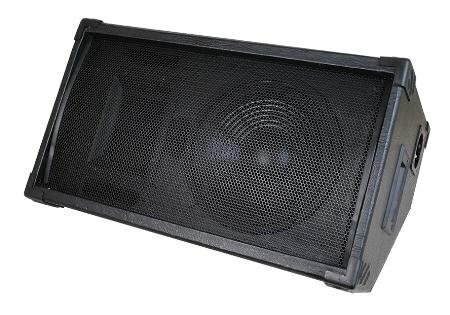 These 10 inch monitors deliver every sound clearly with a Pro Audio 10 inch speaker, 4"x 8"piezo horn tweeter, a frequency response of 45Hz to 20,000Hz, and 100 watts RMS, 200 watts peak power. Great quality monitors are very hard to find, especially at a decent price. The Seismic Audio brand was designed to make the professional musician, as well as the musician low on cash, sound great. With your purchase, you will receive one of these monitors pictured and described above. So, put it in your cart today and get ready for years of trouble-free, crystal clear sound! The Nady PM-100 Near-field Stage Monitor is designed to reduce stage clutter and volume by putting the sound where you can most use it. 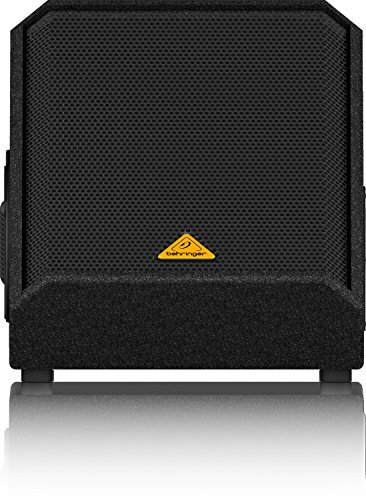 Compact, rugged, and lightweight—the PM Series can be mounted on a mic stand (with optional mic stand mount adapter if needed), set on a keyboard, amp, or table for effective up-close monitoring, or used as a stage monitor with four different angled positions for optimum placement and versatility. Specially designed dual ferro-fluid 5 Inches drivers offer 200W peak power handling capacity (100W RMS), superior gain before feedback, and up to 125 dB maximum SPL. Uniquely tuned response projects audio at the desired frequencies to cut through stage noise while ensuring high feedback immunity. Volume/Impedance selector and two ¼ Inches In/Out jacks for performer adjustability and easy daisy-chaining with up to 15 other PM-100 monitors. Nady Systems has been designing, manufacturing, and marketing wireless microphones since 1976. One of the first wireless innovators, Nady has sold millions of wireless systems worldwide, and continues to provide some of the most innovative/ highest performing products on the market at the most competitive prices. The GH12M is a 2 way passive wedge shaped monitor loudspeaker built from a 12 Inch High Output Mid/Low Ribbed Cone Woofer and a 1.5 Inch High Temp Multi Layer Copper Voice Coil mounted on a Wide Dispersion High Frequency 1 Inch Horn Tweeter for the highest quality sound. These components are housed in computer engineered MDF Acoustic Enclosure to get the most out of your speaker. 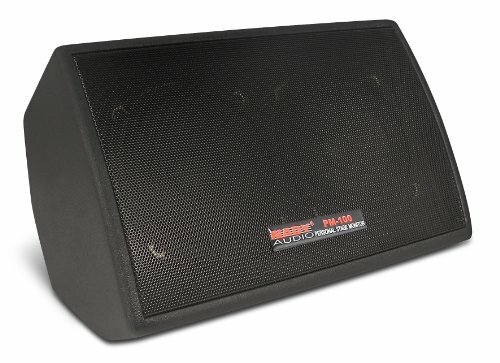 The low end is enhanced by a Tuned Bass Reflex Enclosure to maximize the boom. A steel mesh screen is installed to prevent damage to the speaker and horn. The GH12M is rated at 350 Watts RMS and 700 Watts Peak to get maximum volume from this cabinet. It is wired at 8 ohms to make it easy to daisy chain additional speakers. The Grindhouse brand of Pro Audio gear is an affordable alternative to high priced audio gear. Do not be fooled by the price! Low prices do not always translate to a cheap product. Grindhouse Speakers are high quality product and produce a superb sound. Give them a shot and you will be happy you did. The GH15M is a 2 way passive wedge shaped monitor loudspeaker built from a 15 Inch High Output Mid/Low Ribbed Cone Woofer and a 2 Inch High Temp Multi Layer Copper Voice Coil mounted on a Wide Dispersion High Frequency 1 Inch Horn Tweeter for the highest quality sound. These components are housed in computer engineered MDF Acoustic Enclosure to get the most out of your speaker. 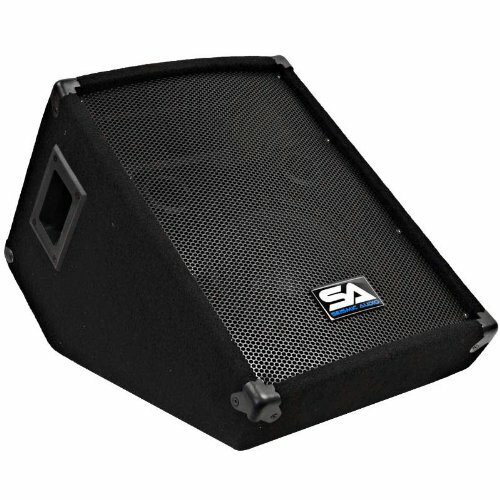 The low end is enhanced by a Tuned Bass Reflex Enclosure to maximize the boom. A steel mesh screen is installed to prevent damage to the speaker and horn. The GH15M is rated at 400 Watts RMS and 800 Watts Peak to get maximum volume from this cabinet. It is wired at 8 ohms to make it easy to daisy chain additional speakers. The Grindhouse brand of Pro Audio gear is an affordable alternative to high priced audio gear. Do not be fooled by the price! Low prices do not always translate to a cheap product. Grindhouse Speakers are high quality product and produce a superb sound. Give them a shot and you will be happy you did. 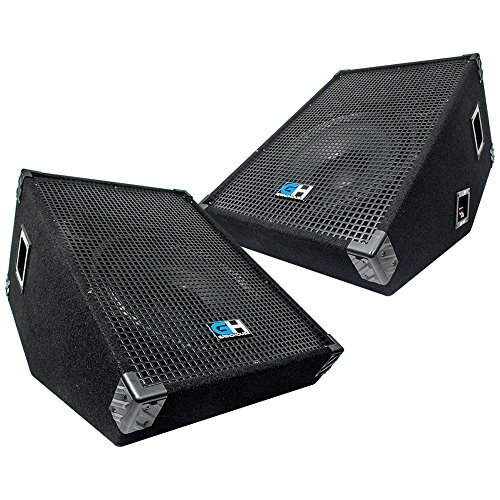 Compare prices on Floor Wedge Monitor at LiveSaler.com – use promo codes and coupons for best offers and deals. We work hard to get you amazing deals and collect all avail hot offers online and represent it in one place for the customers. Now our visitors can leverage benefits of big brands and heavy discounts available for that day and for famous brands. We try to makes comparison shopping easy with Product Reviews, Merchant Ratings, Deal Alerts & Coupons. Find Deals, Compare Prices, Read Reviews & Save Money.